Final Fantasy Legends: Warriors of Light and Darkness is a brand new entry in the Final Fantasy series even if it doesn't look like it. Though the mixed reaction to Final Fantasy XIII made Square Enix unsure about where to take Final Fantasy, the company hasn't forgotten about the series' past. The latest next-gen installment of the series may have felt uncharacteristic to some, but the creators of the sequel to Final Fantasy IV are back with a brand new Final Fantasy game that will make classic RPG fans feel right at home. 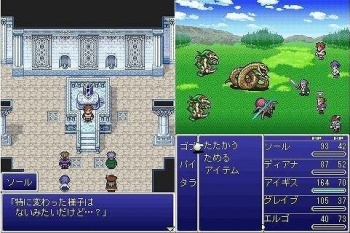 Square Enix's Final Fantasy IV: The After Years was a follow-up to Final Fantasy IV that kept the original game's style in both visuals and gameplay. The team that developed it is now working on Final Fantasy Legends: Warriors of Light and Darkness (name translated by Andriasang), which is a brand new Final Fantasy game for Japanese cellphones created in the same style as The After Years. Turn-based battles with up to five characters and 2D sprite-based visuals will be featured in Legends, along with other classic Final Fantasy elements. The story will be brand new, though not much on it has been revealed yet. It'll involve a struggle over the world's crystals, which will no doubt be sought after by an evil force for a nefarious purpose. The job system returns as usual, which gives players the ability to swap characters' abilities. Jobs will apparently be highlighted through Final Fantasy Legends' episodic distribution model, though exactly how has not been provided. Don't let the fact that Final Fantasy Legends is a cellphone game in Japan for now get you down. Final Fantasy IV: The After Years was first released on cellphones but made it to in North America as a WiiWare title. It wouldn't be surprising to see Legends make it over here too, but we'll probably have to wait until all of its episodes are released in Japan first, and then a bit longer. The game's first episode will be out in Japan in September. Square Enix also has a Japanese teaser site up for Final Fantasy Legends that plays the classic Final Fantasy theme. Ahh, memories. I for one am pretty excited that Square Enix is making it a priority to retain classic elements in some of its releases, also seen in the upcoming Final Fantasy: The 4 Heroes of Light for the Nintendo DS.